Clams are much more expensive than mussels, but I love their sweet flavour so occasionally Lo Jardinièr and I treat ourselves to some from the coquillage van that brings them, along with oysters and mussels, to the village on Saturday mornings straight from the Etang de Thau at Bouzigues. 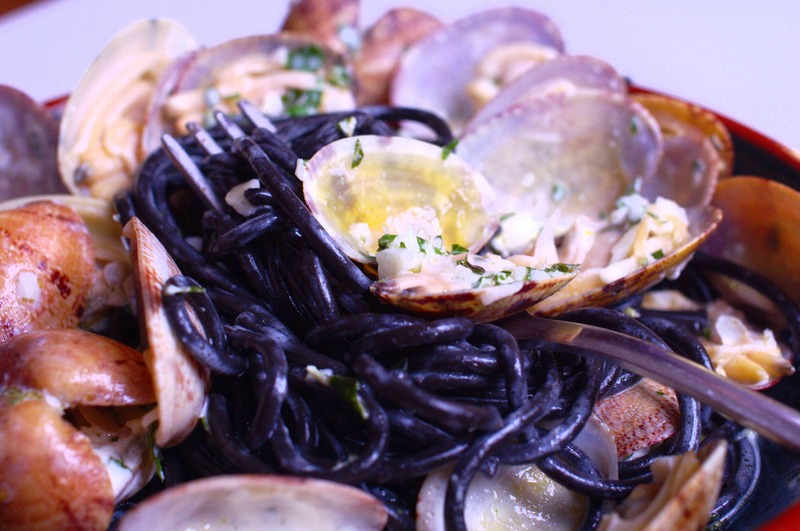 We had some black squid-ink spaghetti so we cooked that while the clams opened slowly in a wide pan with just a little olive oil. When they were all open I added a few tablespoons of crème fraiche and some chopped oregano and garlic to the pan, mixed it well with the juices from the clams and added it all to the pasta. It took about ten minutes to make for lunch…. 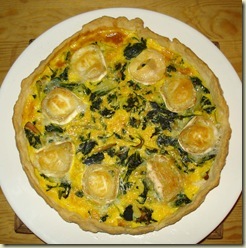 and serve with a glass of Viognier white wine made in the village. 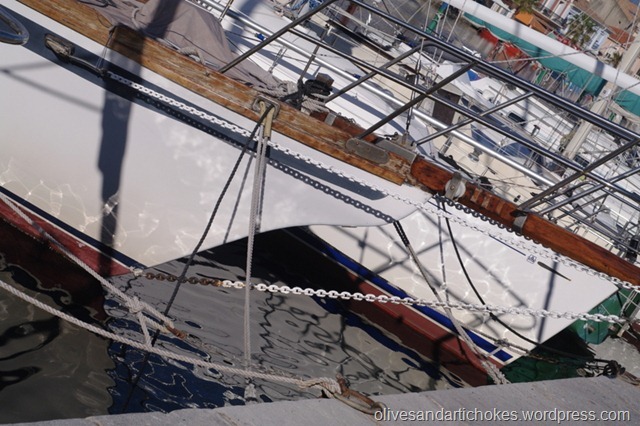 In warm sunshine, 16°C, on Monday we had a family day out to Bouzigues. Quite a change from last week’s snow! 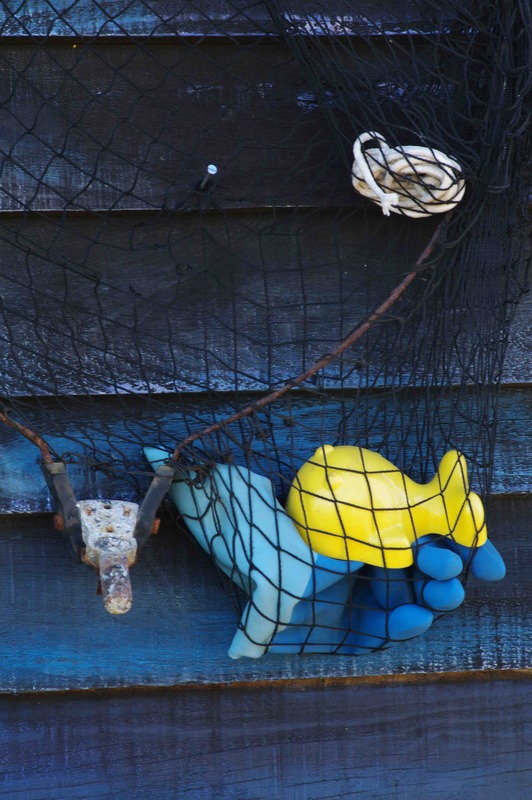 As we usually do, we wondered along the shore where the producers’ huts and workshops are, looking at the boats, the nets and the work that was going on, asking a few questions of one of the producers and learning and seeing something new as we do each time. 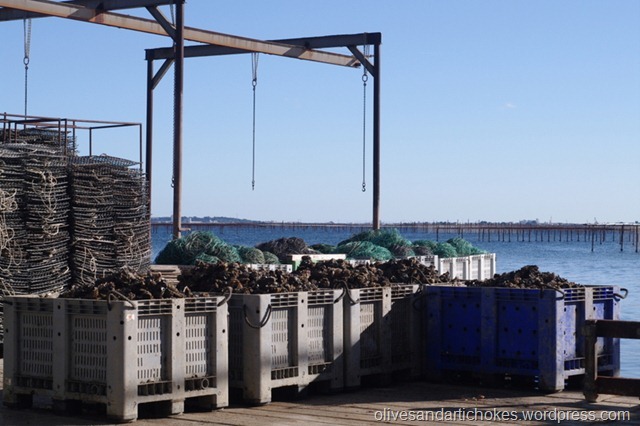 We saw these ropes of oysters that had just been glued on and were lying in corrugated racks ready to be taken out to the beds, the frames that you can see in the distance in the photo above. After lunch as we walked by the fishing port a huge dark cloud came over the lagoon – time to go home! On one of those November days when it feels like spring, with bright sunlight and 17°C temperature, we went to Bouzigues yesterday. 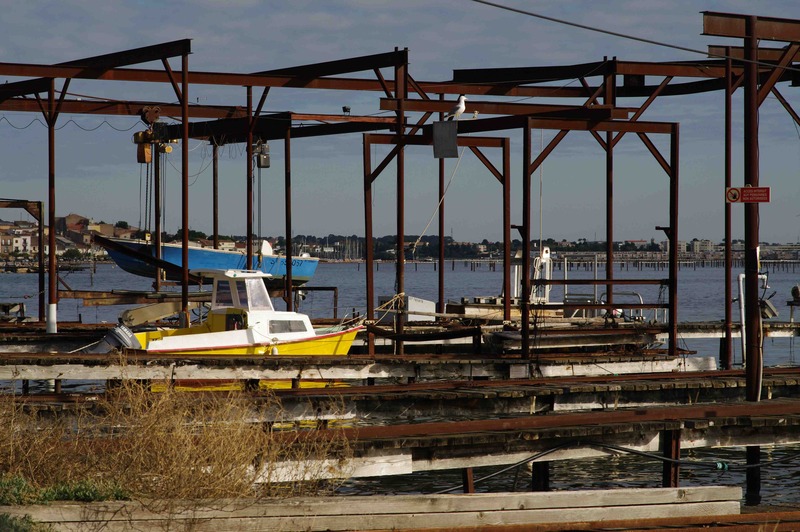 Many of the traditional and more modern boats were moored in the small port next to the museum whose displays explain the industry and natural environment of the area around the Etang de Thau. 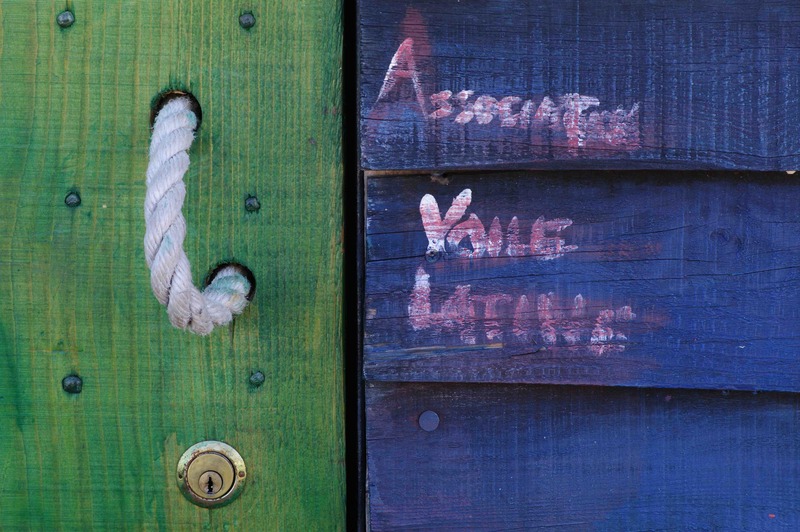 Because Occitan and Catalan are similar languages the same terms, with minor differences in spelling and pronunciation, are used in both regions. One of the shell fish producers was leaving the port to work in the beds out in the lagoon, but in a much more modern motorised boat. 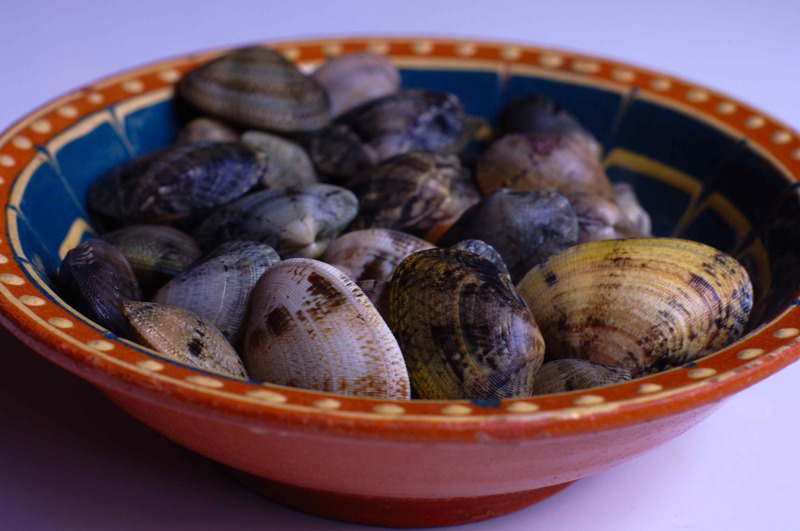 As we usually do when we’re in Bouzigues, we had lunch at Chez la Tchepe, a simple café where there are crates of raw shell fish, as well as cooked prawns and sea snails, at the counter. 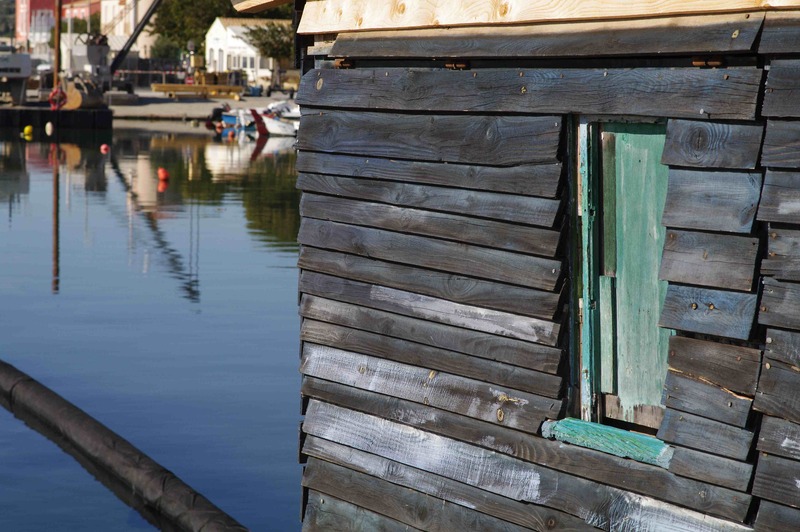 You make your choice, order bread, home-made mayonnaise and a bottle of wine and sit at tables in the sun, just across the road from the lagoon and in sight of the mussel and oyster beds, for the short wait until the shells have been opened for you. We had oysters and mussels, a dozen of each. I’ve only recently discovered how much I like raw mussels and I’m making up for all the years when I’ve handed them over to Lo Jardinièr to enjoy! 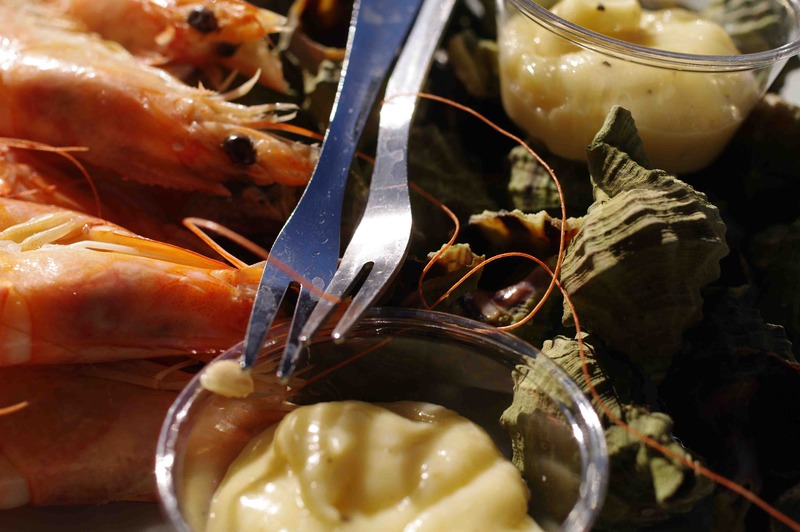 And, below, a plate of prawns and escargots de mer, sea snails, with mayonnaise. And, of course, a bottle of Picpoul, white wine made in a small area between the Etang de Thau and Pézenas, which goes especially well with sea food. 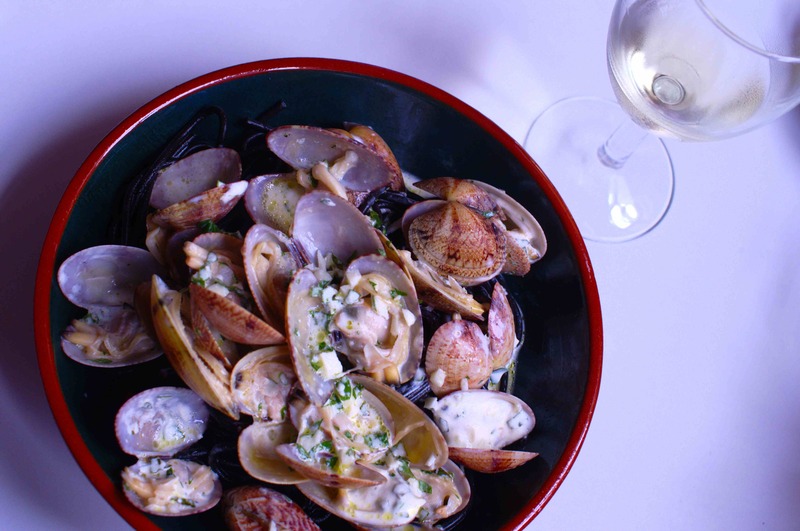 There seems to be a magical relationship between the agricultural produce of an area and the wine made nearby, something we’ve found in many regions and which is particularly true of Picpoul and shell fish. It was lunchtime and we were driving home, so it was helpful that the café keeps the cork for you so you can take home the wine that you can’t drink. 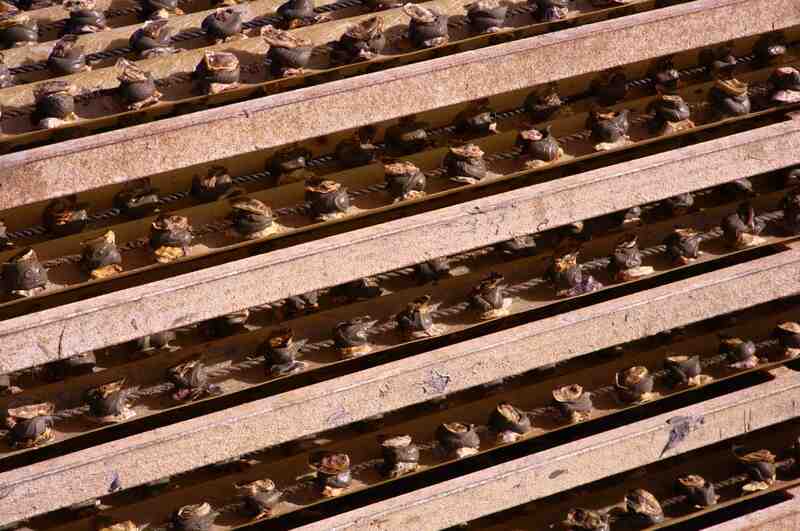 As we left Bouzigues we took a detour to the more industrial area where the shell fish are brought in from the lagoon, on tracks along these jetties and then on conveyor belts into the packing area. It’s an industry, but on a small, human scale. I’ve just realised that I haven’t posted on this blog for a week and I haven’t yet posted everything I want to from my Valencia/Xativa/Barcelona trip. 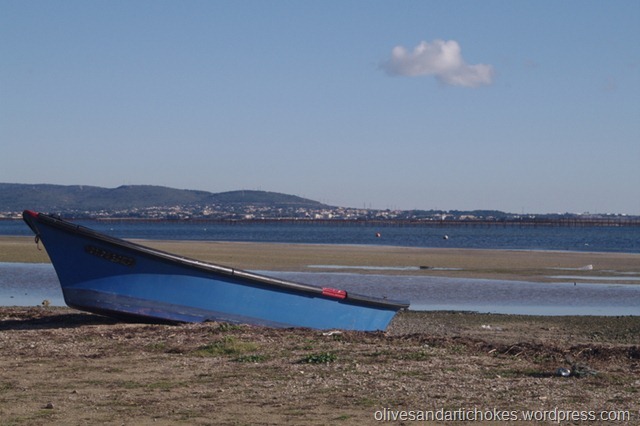 I will during the next few days but in the meantime here are some shell fish we’ve enjoyed over the past few days and their place of origin, the Bassin de Thau between Bouzigues and Sète. 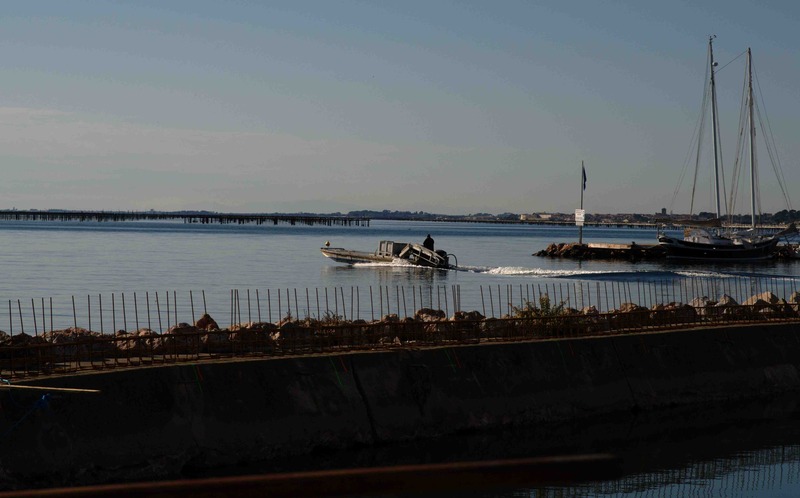 These are just a few of the hundreds of frames covering a stretch of the lagoon from Bouzigues to Marseillan, an industry that gives employment to 3,000 people in this area. 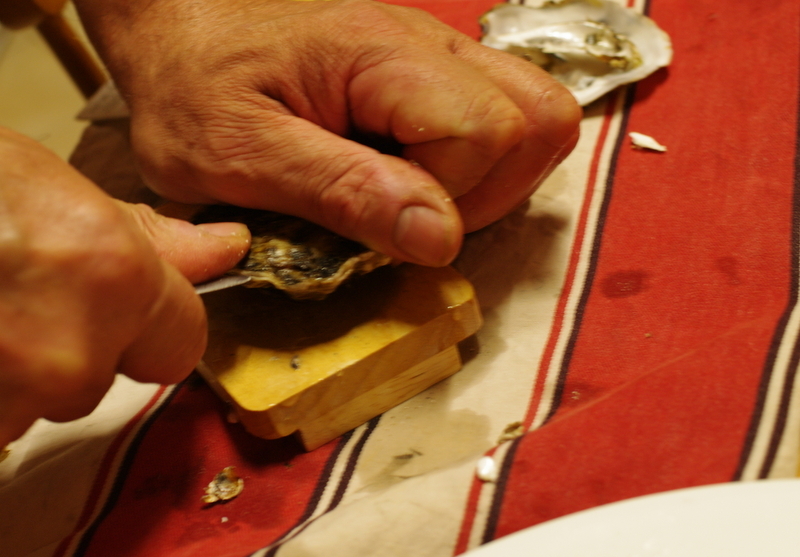 With relatives staying who love shell fish, we ate oysters and mussels and other coquillage supper at home on Saturday when Lo Jardinièr opened the oyster shells using a special knife and a wooden device to hold the shell and make it less likely that he would cut himself. 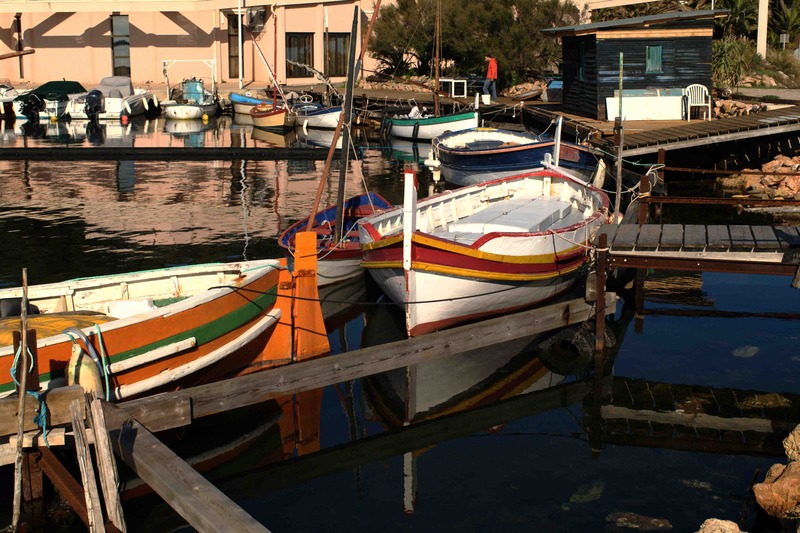 Yesterday lunchtime we went to the source and ate at Chez la Tchepe on the waterfront at Bouzigues. This is a wonderful, simple café with tables out on the roadside terrace and indoors next to the counter where the raw shell fish which is their speciality is displayed in plastic crates. 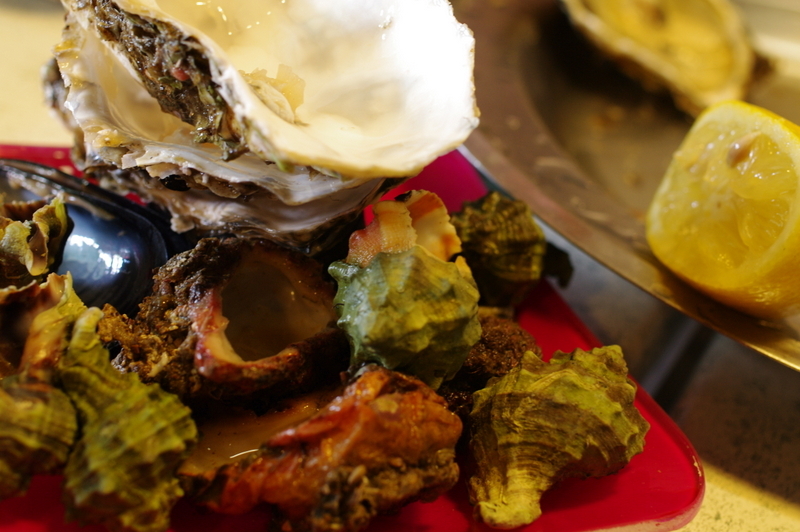 We ordered platters of oysters, raw mussels, cooked prawns and escargots de mer (sea snails), and a species we hadn’t eaten before – violets or sea potatoes, strange creatures with a leathery skin and a sea-flavoured edible centre. 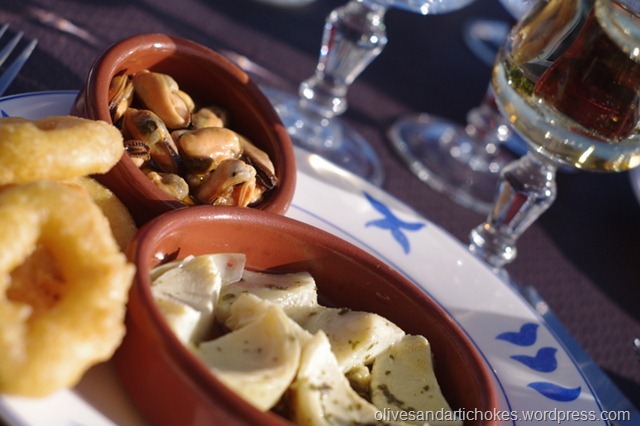 Having started with tielles, the sea food pies that are a local speciality, we were served the shell fish with a basket of white and whole grain bread and a bottle of Picpoul, the white wine grown in this are which goes especially well with fruits de mer. 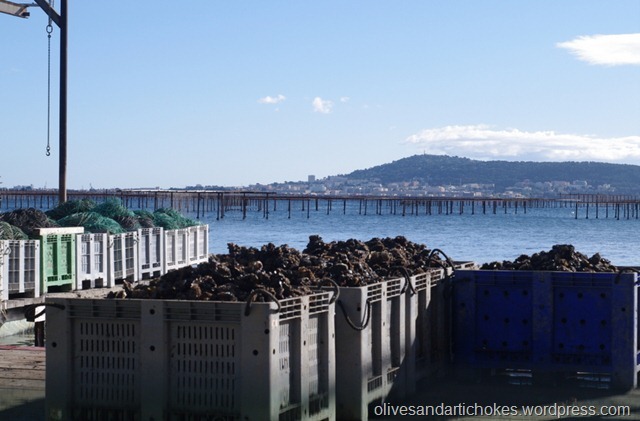 These are the oyster beds in the Etang de Thau, a sea-water lagoon where shell fish production is the main activity. 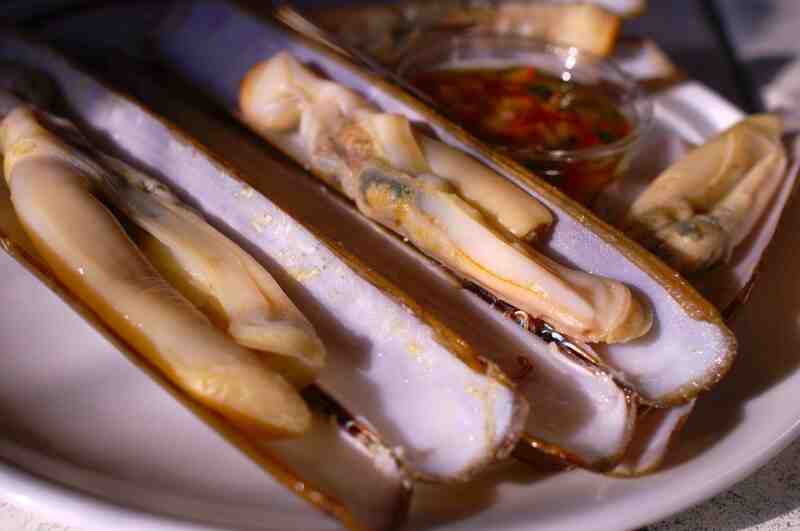 The mussel and oyster frames support strings of shells which are glued on when the shell fish are young. They are then lowered into the water to eat and grow. 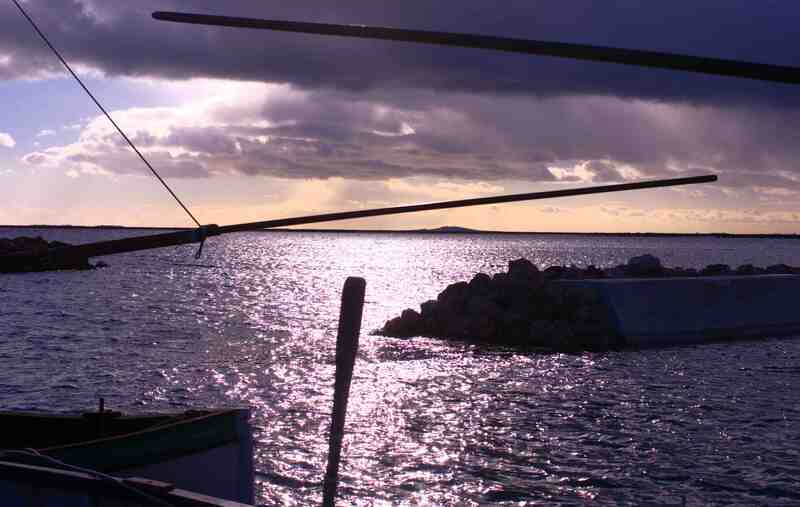 These rows of frames stretch from Marseillan, past Mèze and on to Bouzigues (to the left of this picture) and across the unpolluted water towards Sète. 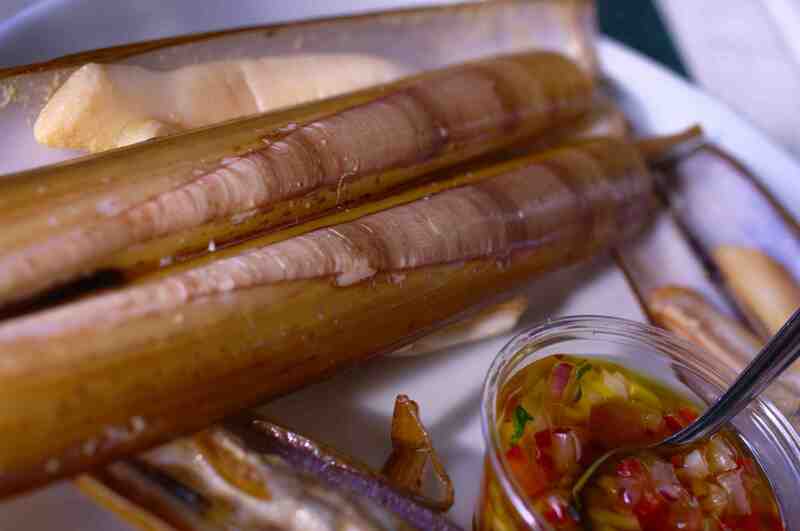 The water really is unpolluted – it’s the only place in France where shell fish is produced that doesn’t have to go into purification tanks before sale, a status that is zealously guarded by the producers here. And best of all, this is a sustainable method of food production which doesn’t use up the sea’s resources as other fish and sea food can. 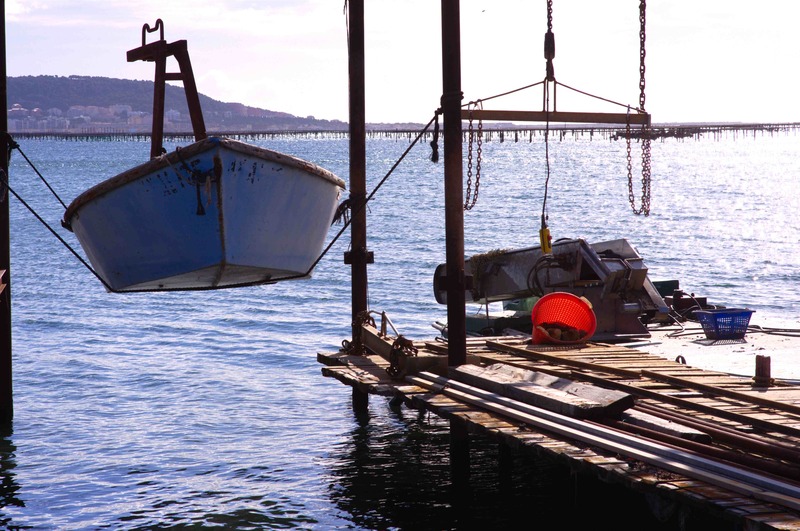 It’s a major industry in the area, rivalled only by the Picpoul vines which grow so well along the shores of the lagoon. 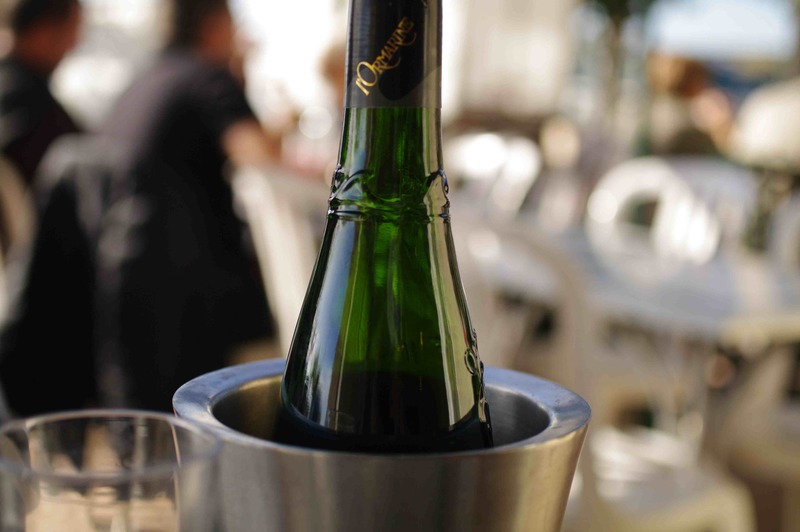 The name Picpoul means ‘sting the lips’ and this white wine does have a fresh, sharp quality. 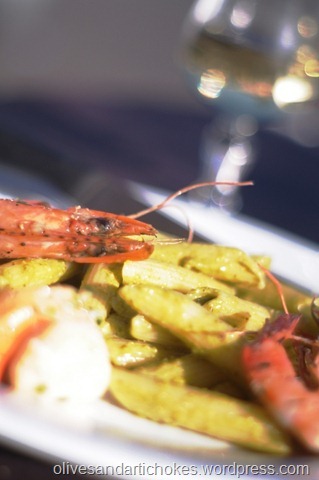 By some miracle of nature, Picpoul wine is an excellent accompaniment for sea food. I’ve noticed this convenient marrying of flavours of local products with local wine in other areas, Cahors red wine and lamb from the Causse de Limogne, for example. 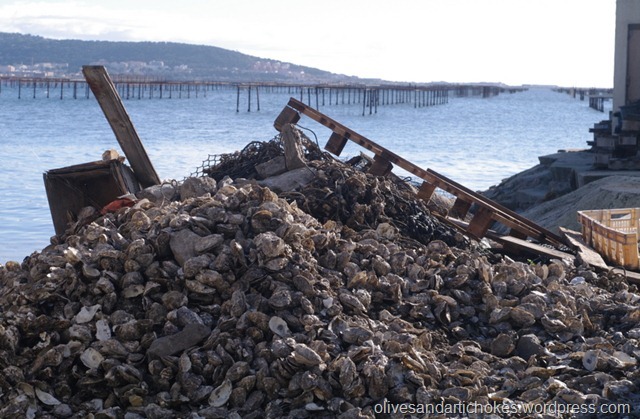 The industrial area of Mèze, with the shell fish frames and Sète in the background…and no, that’s not the remains of our lunch in that huge pile of oyster shells! There’s a beach at Mèze, although you wouldn’t want to swim there…. It was hot in the sun and we found a table for lunch outside at one of our favourite restaurants, Le Sanboulou, with more or less the view in this picture. 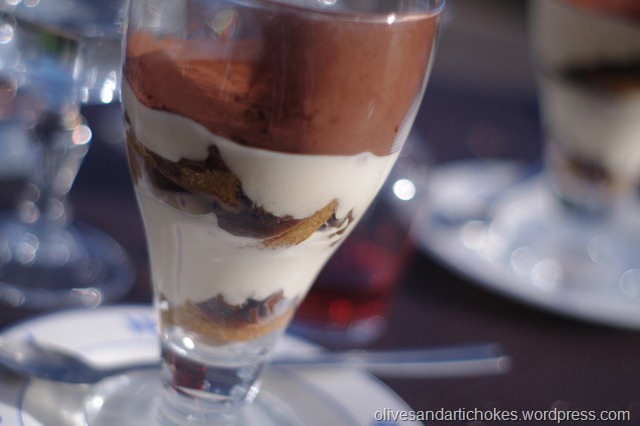 The excellent menu du jour (only 13.50 euros) gave us tapas – mussels in chilli sauce, artichoke hearts, marinaded sardines and battered squid rings – followed by pasta with scallops and gambas (large prawns) in pistou (basil and garlic sauce), and homemade tiramisu for dessert. Of course, I had a glass of Picpoul too! We’re very lucky to have a shell fish producer’s van from Bouzigues that visits the village on Thursday afternoons and Saturday mornings to sell oysters, clams escargots de mer (a sort of whelk) and mussels. 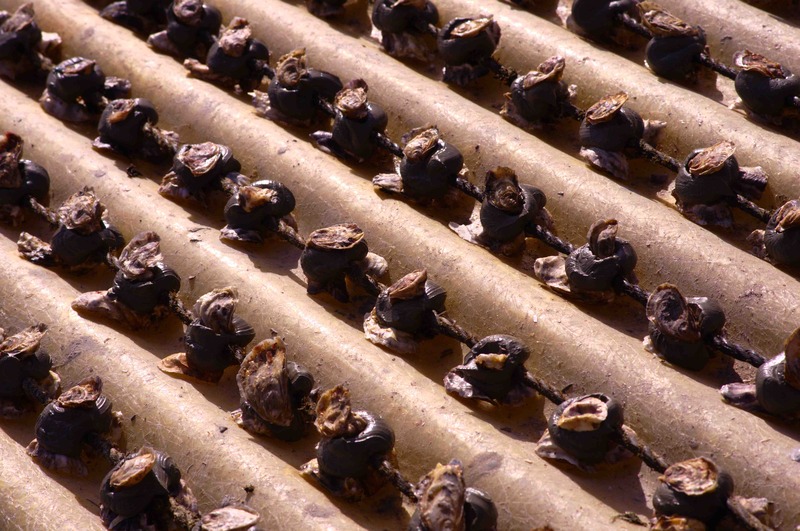 The mussels we buy are reared in the salt-water lagoon which has carefully protected water so that the shell fish does not have to be kept in purification tanks, as they do in other areas, before being eaten. We cooked the mussels in a little white wine until they had all opened then discarded the half of each shell that was empty. 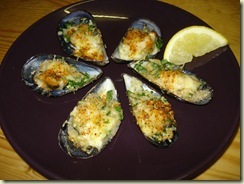 We mixed breadcrumbs with chopped garlic and a whole finely chopped piment d’Espelette (you could substitute dried paprika, and I often use thyme instead of pepper) and covered the mussels in their shells with the mixture, added a little olive oil and a spoonful of finely grated hard cheese to each one and put them under the grill to brown. Simple! We buy the ‘moyenne’ (medium) rather than the larger ‘pour farcir’ (for stuffing) mussels, especially in summer when even the medium ones are nice and fat and very tasty. 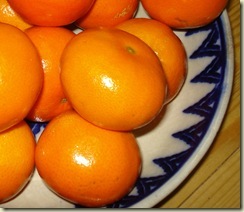 A kilo will serve two as a main course or 4 to 5 as a first course, with a slice of lemon to squeeze over them. The tomatoes are coming to an end, and some of our gardening neighbours have already uprooted their plants, resigned to its being a bad year for them. We’re picking and eating peppers every day and we’re pleased we planted so many different varieties which all have their own characteristics: the ones on the left of the photo above are Corno di Toro which are good for stuffing; there’s a spicy Kolaska next to the aubergine and some Longues des Landes on the right – they’re both good varieties for grilling on the barbecue. 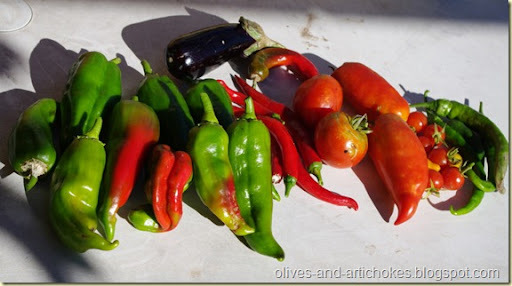 In the centre there are a few red chillies. 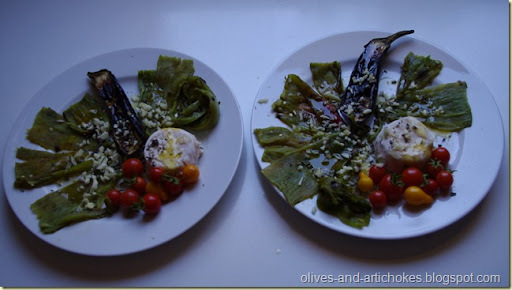 For lunch today we grilled some green peppers and the aubergine on the barbecue. 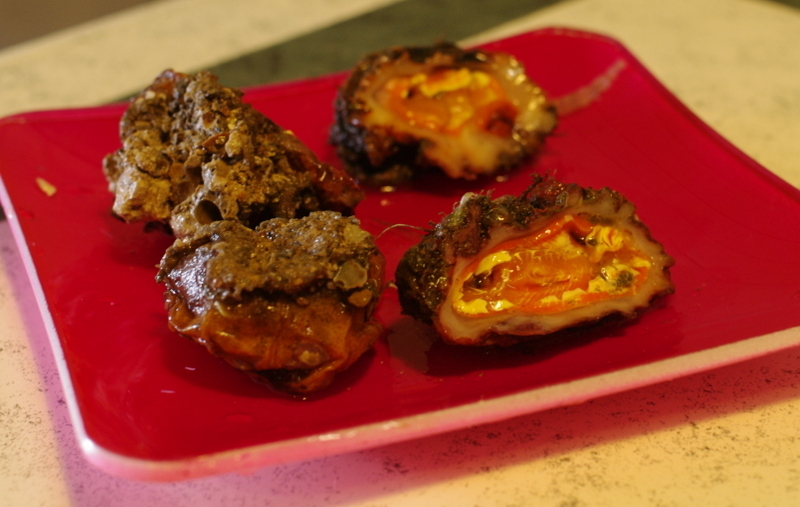 I then skinned the peppers, which is very easy when they’ve been grilled and the outer skin has blackened. I made a salad with them, some oregano and chopped garlic, goats’ cheeses from Mas Rolland and some cherry tomatoes, added a bit of salt and some olive oil and served them with fresh Aveyronnais bread. 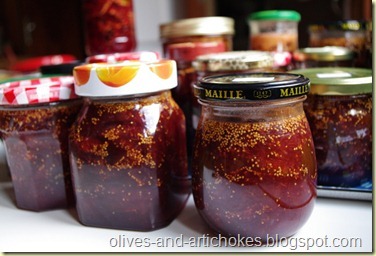 We picked another five or six kilos of figs this morning and made some more jam. The recipe is very simple: for each 600 gm of figs, chopped and put in a large pan, I added 400 gm sugar and the juice of half a lemon. I brought them all to the boil and simmered until the jam thickened and began to set when a spoonful was put on to a cool saucer. Then bottle in sterilised jars. 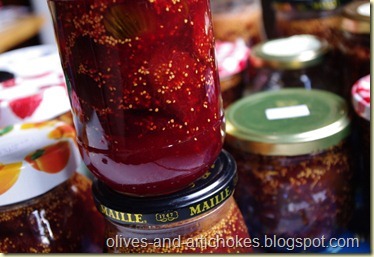 We now have twenty jars of mixed, green or black fig jam, so we know we’ll have something for winter breakfasts. As usual on a Saturday morning, the coquillage van from Bouzigues came to the village, so we bought a kilo of mussels and ate them this evening in a sauce made with onions, garlic, wild fennel, lardons, white wine and crème fraiche. And as usual they were delicious. We’re very lucky that the coquillage (shellfish) van comes to the village twice a week bringing sustainably produced and delicious shellfish from Bouzigues on the Etang de Thau, a salt-water lagoon only 30 or so kilometres from here. 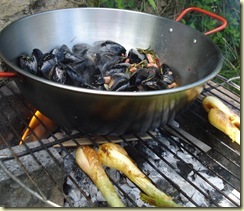 One of our favourite ways of eating mussels is to cook them on the barbecue in a big open pan – we use a paella pan or a Spanish sartén honda, both of which are available very cheaply in a local discount store. 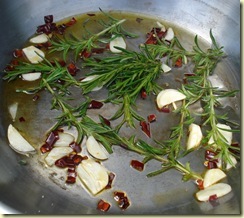 Today I lightly sautéed a couple of sliced garlic cloves, some sprigs of savoury and rosemary, some lardons fumés (smoked bacon pieces) and a chopped dried Espelette pepper in olive oil over the flames and then left them to infuse while we cooked some whole Spanish sweet onions which I’d just pulled out of the ground. When the onions were done and while we were eating them as a first course, the mussels were left to open and cook over the fire. 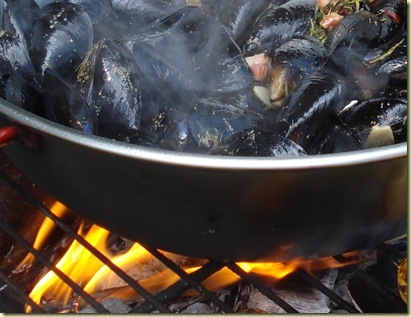 When the mussels are cooked we just put the pan in the middle of the table for people to share, with a sprinkling of chopped fresh garlic, a squeeze of lemon juice and some crusty bread. 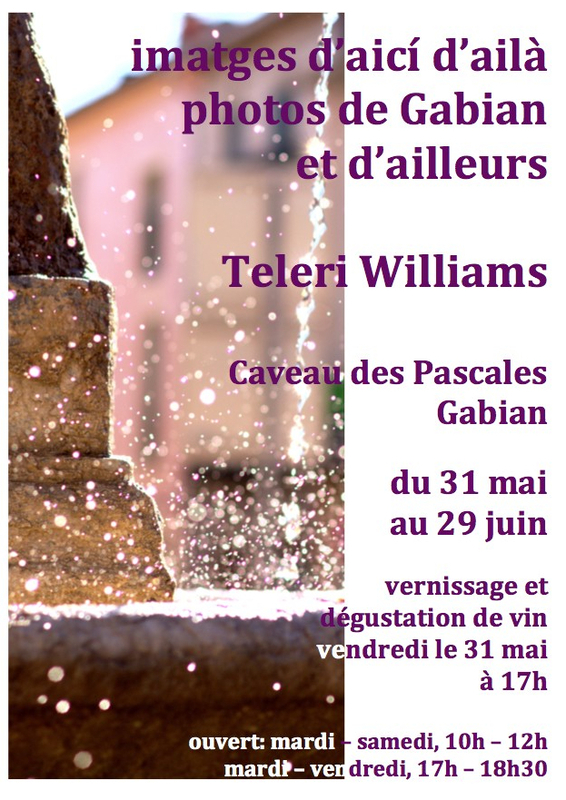 And a glass or two of rosé wine from the Domaine des Pascales in the village. The sun even came out for an hour or so while we were eating! 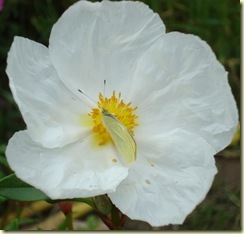 The white cistus is now in flower and one of its flowers had a yellow butterfly on it. 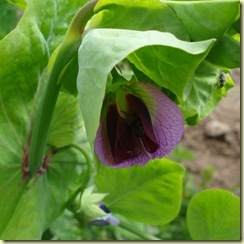 The mangetout peas are flowering too – such beautiful petals, as lovely as sweet peas but with the advantage of pods to eat later. 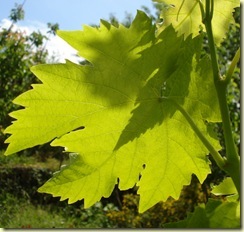 Vines have insignificant flowers so this is one plant where the leaves are more impressive, especially when the sun casts shadows of one leaf upon another. 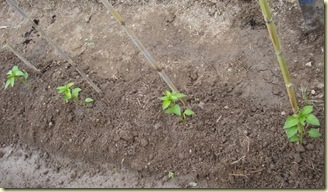 We did some work too, and planted out most of our pepper plants. 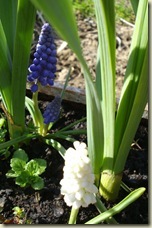 There are a few more to do tomorrow and some which we want to grow in pots outside the house. daffodils / les narcisses …. 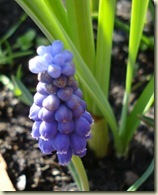 and grape hyacinths / et les muscaris. 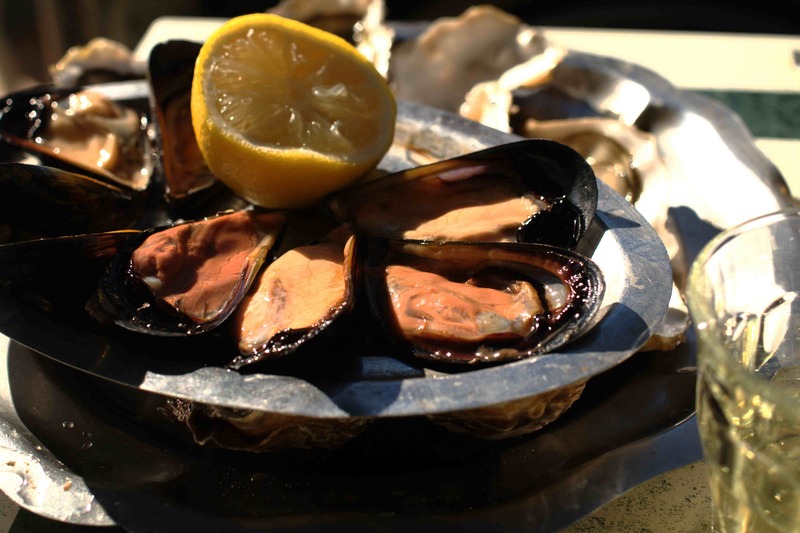 On Friday at an otherwise excellent restaurant in Agde, I ordered moules gratinées and was shocked to find when they arrived that they were huge, green-shelled creatures which I knew don’t grow near here. 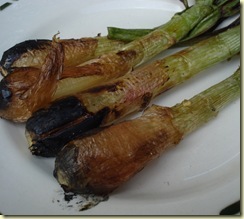 I asked the waiter and he said that they came from New Zealand! 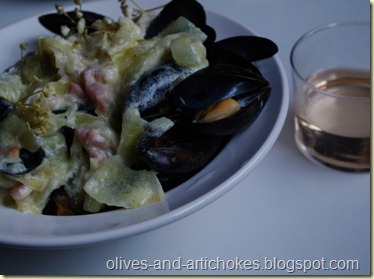 Although he added that they used local mussels for moules marinières. 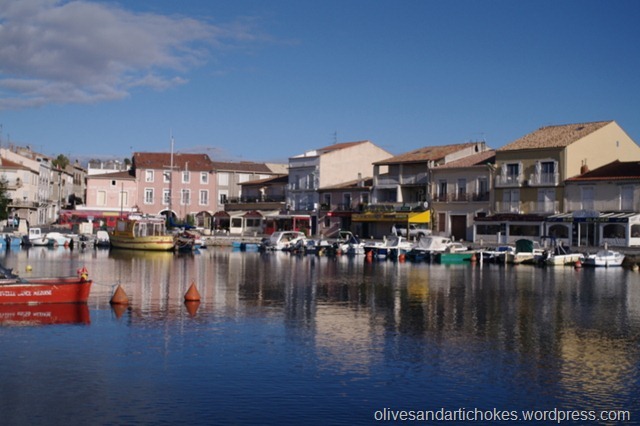 Agde is only about 10 km from the nearest mussel beds in the Bassin de Thau. 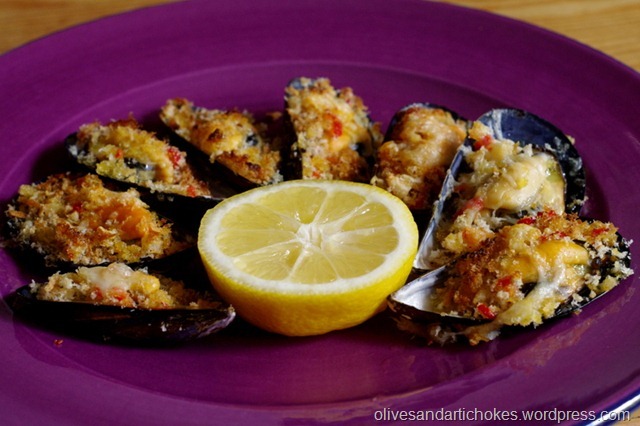 These New Zealand mussels had suffered from their long journey and months in the freezer – they were tough and tasteless. How sad, because apart from this the food was good at this family-run restaurant on the quayside, where the woman chef came to our table and explained her ratatouille recipe in great detail – and it was the best ratatouille we’d ever had in a restaurant, as good as we make at home! Vendredi j’ai commandé des moules gratinées dans un restaurant à Agde et j’ai été étonnée de trouver qu’elles sont des grandes moules au coquilles vertes qui ne viennent pas d’ici. Elles sont venues de la Nouvelle-Zélande. 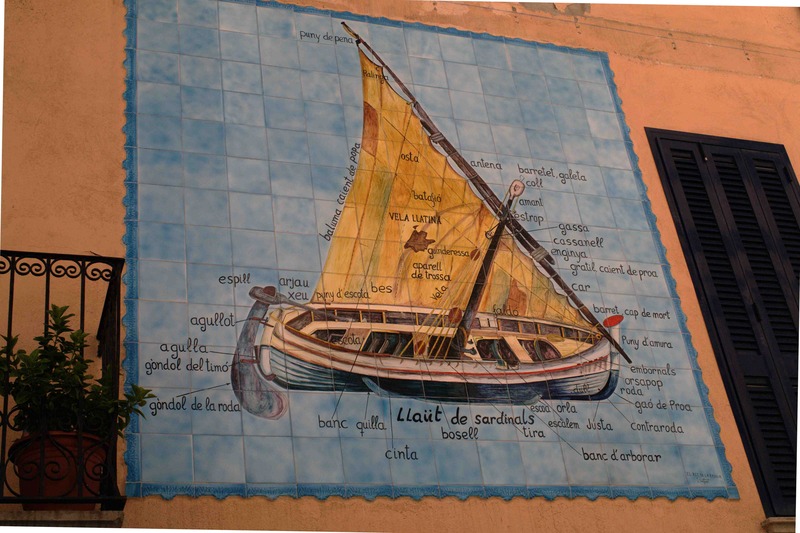 Agde n’est que 10 kilometres du Bassin de Thau. Cettes moules ont souffert de leur voyage long et les mois qu’elles ont passé au congelateur. We planted out 10 celery plants from seed given to us by Kate. I sowed the seed in October and they have grown very slowly on the windowsill through the cold weather. They’re doing well now, though. Thanks, Kate! The artichoke plant on the right is supposed to be the same variety as its bigger neighbour – Violet de Provence. 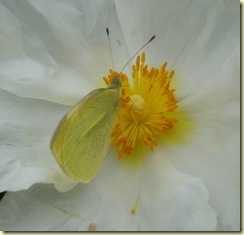 I can’t remember whether the others had similar smooth-edged leaves when they were small. We’re so lucky here in Gabian that the coquillage van comes to the village twice a week bringing fresh shellfish from Bouziques. Oysters seem to be one of the best foods we can get from the environmental point of view … and they’re delicious and very good value. In the Guardian newspaper last Saturday Hugh Fearnley-Whittingstall was encouraging readers to eat oysters, raw or cooked. He gave some recipes – including one for oyster and chard fritters, which I want to make sometime soon, and another for oysters with chorizo. 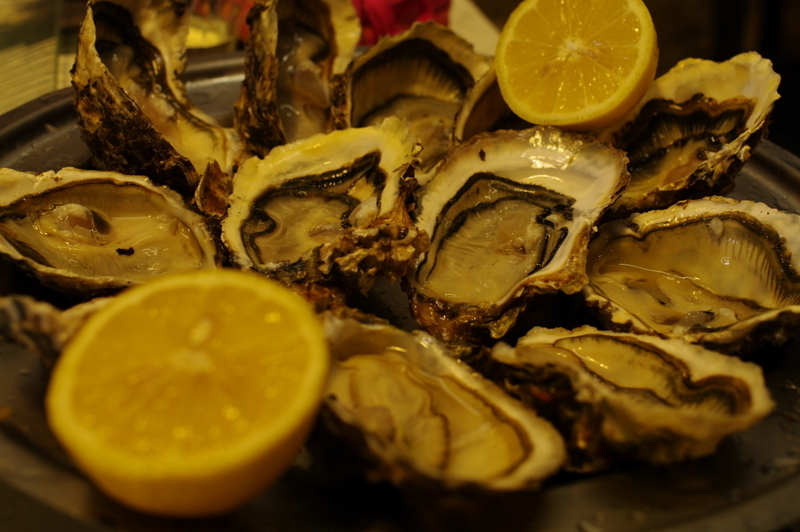 This recipe was for six oysters to serve six people as a starter – well, here in the Midi we eat oysters in larger quantities than that, but the recipe sounded very tempting. 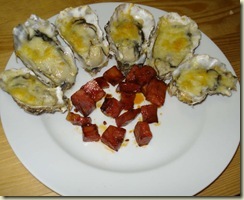 I had a nice chunk of chorizo which I’d bought from the charcutier at the market yesterday and realised that I could combine this with one of my favourite ways with oysters – huitres gratinées, putting them under the grill with white wine and cheese. 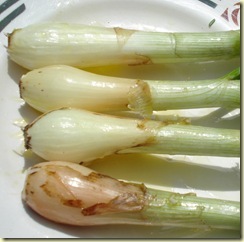 We started with some of our leeks, and onions, sautéed in olive oil and then served with shavings of parmesan. Les poireaux sautés aux oignons et l’huile d’olive. Servir au parmesan. 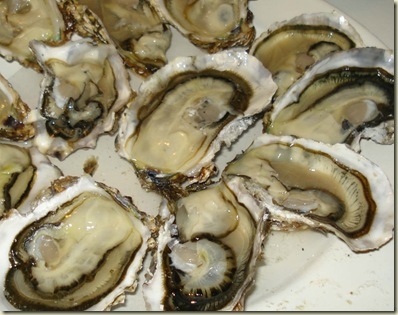 We added chopped garlic, olive oil, white wine and grated Cantal cheese to the oysters in their shells and put them under the grill for about 5 minutes until the cheese began to brown. In the meantime we cooked the diced chorizo in olive oil, then served it with the oysters and poured the spicy oil from the frying pan over the oysters. We finished this Thursday evening feast with some of the lovely Spanish clementines which are in all the local shops and markets at the moment. We felt we deserved all of this after a few hours’ hard work earlier on, spreading another trailer-load of goat manure on the garden.